Inspecting for Pallet Rack Damage - CMI Sales Inc. If you stack and store your inventory on a pallet rack system, it’s critical to conduct regular inspections. Incorrect loading, improper installation or modifications, and forklift damage can all contribute to an unsafe work environment. Inspections can minimize the risk of accident injury, damaged inventory and can even offer feedback to improve operational practices. Drivers are not likely to report collisions, so you may not know if a rack has been compromised. It is not uncommon to try and avoid reporting a forklift encounter with your racking system. Obvious damage can be quickly rectified if reported immediately. Hidden damage such as a crack or minor compression may be overlooked and lead to an unwanted collapse. Routine inspections can minimize the potential hazards of these forklift encounters. Rack Inspections: Check it out! Train someone internal to your company who doesn’t typically work the warehouse to do this job, if you do it internally, or to do spot checks between professional inspections. The RMI (Rack Institute of America) has many resources for rack users. There are independent inspectors offering services. However, be aware that these are typically not certified engineers and they cannot typically stamp post-inspection reports as meeting any industry or government standard. Are the racks plumb and level? Rack systems are engineered to specific tolerances defined by plumb and square installation. If not installed properly to accommodate the floor slab thickness or level, the risk of collapse is increased. Shims and concrete anchors must be used to level, plumb and secure the racking uprights. Peer down your row and identify those uprights that seem misaligned or untrue. Cracks or paint blemishes in paint coatings can allude to hidden damage. Is the rack overloaded? Remember that racking beams have rated capacity per pair, and uprights are engineered to support overall system weight based on defined shelf elevations for the beams. for their capacity ratings. Also, racking capacity also is impacted by the uniformity of your loads. One overloaded section can be the root cause of a larger collapse. Damage, no matter how minor in appearance, can reduce the upright capacity for its section of the rack. Replace or repair these uprights immediately. Are column protectors damaged? If they are, remove them and be sure the rack upright didn’t also take damage in the incident that damaged the protector. Place a steel straight on the surface of the concave side of a damaged rack upright. 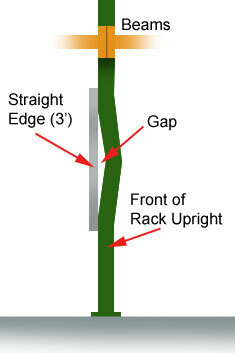 The straight edge should be centered on the damaged section’s length as accurately as possible. This allows you to gauge the gap distance. Like the upright, beams can suffer damage from impacts (either from forks, or from pallets), or by overloading. They can be knocked out of secure fastened position or either overloaded or improperly loaded, leading to failure. Check for deflection: Beams naturally deflect beneath a load, and a certain amount of deflection is acceptable. It should disappear when you unload the beams. If it doesn’t, you should replace the beams. Beams should not deflect more than 1/180 of the total length of the beam (for a 96” beam, that’s 1/2″). Are the beams properly attached to the uprights? Are the beams seated tightly into uprights? Has there been impact to the area? Are there broken welds or other signs of damage? Are the clips, bolts, or safety pins, or beam attachment pins missing or damaged?Most racks use some kind of connector hardware to ensure safety. Make sure to replace the missing ones and find the root cause of any that are broken and replace. Just doing the inspections isn’t enough – you must document and take action when needed. Documentation helps you track the regularity and thoroughness of the inspection process in the event of any future issue. A certified engineer should be engaged if you have plans for major changes to the racking layout or shelving elevations, or if you have had a significant accident related to your rack system.